This article is about the realm of Norse Mythology. For other uses of the names Asgård, Asguard, Asgaard, Aesgaard, Aasgard, or Asgard, see Asgard (disambiguation). In Norse religion, Asgard (/ˈɑːsɡɑːrd, ˈæs-/; Old Norse: Ásgarðr; "Enclosure of the Æsir") is one of the Nine Worlds and home to the Æsir tribe of gods. It is surrounded by an incomplete wall attributed to a Hrimthurs riding the stallion Svaðilfari, according to Gylfaginning. Odin and his wife, Frigg, are the rulers of Asgard. Asgard is home to many named locations; the most well known include Valhalla, where half of all those who die in battle are sent, and Fólkvangr, where the other half go. The primary sources regarding Asgard come from the Prose Edda, written in the 13th century by Icelandic historian Snorri Sturluson, and the Poetic Edda, compiled in the 13th century from a basis of much older Skaldic poetry. 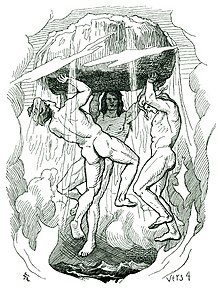 Völuspá, the first poem of the work, mentions many of the features and characters of Asgard portrayed by Snorri, such as Yggdrasil and Iðavöllr. Asgard is composed of 12 realms including Valhalla, Thrudheim, Breidablik that are ruled by Odin, Thor and Baldr respectively. The Prose Edda presents two views regarding Asgard. In the Prologue Snorri offers a euhemerized and Christian-influenced interpretation of the myths and tales of his forefathers. Asgard, he conjectures, is the home of the Æsir (singular Ás) in As-ia, making a folk etymological connection between the three "As-"; that is, the Æsir were "men of Asia", not gods, who moved from Asia to the north and some of which intermarried with the peoples already there. Snorri's interpretation of the 13th century foreshadows 20th-century views of Indo-European migration from the east. Snorri further writes that Asgard is a land more fertile than any other, blessed also with a great abundance of gold and jewels. Correspondingly, the Æsir excelled beyond all other people in strength, beauty and talent. Snorri proposes the location of Asgard as Troy, the center of the earth. About it were 12 kingdoms and 12 chiefs. One of them, Múnón, married Priam's daughter, Tróán, and had by her a son, Trór, pronounced Thor in Old Norse. The latter was raised in Thrace. At age 12 he was whiter than ivory, had hair lighter than gold, and could lift 10 bear skins at once. He explored far and wide. His father, Odin, led a migration to the northern lands, where they took wives and had many children, populating the entire north with Aesir. One of the sons of Odin was Yngvi, founder of the Ynglingar, an early royal family of Sweden. These accounts were written 200 years after the Christianization of Iceland. 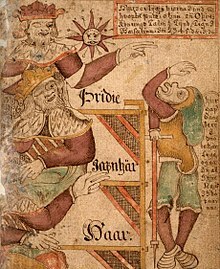 In Gylfaginning, Snorri presents the mythological version, taken no doubt from his sources. Icelanders were still being converted at that time. He could not present the myths as part of any current belief. Instead he resorts to a debunking device: Gylfi, king of Sweden before the Æsir, travels to Asgard and finds there a large hall (Valhalla) in Section 2. Within are three officials (three Aesir Kings), whom Gylfi in the guise of Gangleri is allowed to question about the Asgard and the Æsir. A revelation of the ancient myths follows, but at the end the palace and the people disappear in a clap of thunder and Gylfi finds himself alone on the plain, having been deluded (Section 59). In Gylfi's delusion, ancient Asgard was ruled by the senior god, the all-father, who had twelve names. He was the ruler of everything and the creator of heaven and earth (Section 3). During a complex creation myth in which the cosmic cow Audhumbla licked Búri free from the ice, the sons of Buri's son, Bor, who were Odin, Vili and Vé, constructed the universe and put Midgard in it as a residence for the first human couple, Ask and Embla, whom they created from driftwood trees in Section 9. The sons of Bor then constructed Asgard (to be identified with Troy, Snorri insists in section 9) as a home for the Æsir, who were divinities. Odin is identified as the all-father. Asgard is conceived as being on the earth. A rainbow bridge, Bifröst, connects it to heaven (Section 13). In Asgard also is a temple for the 12 gods, Gladsheim, and another for the 12 goddesses, Vingólf. The plain of Idavoll is the centre of Asgard (Section 14). 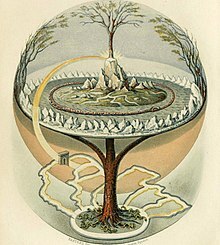 The gods hold court there every day at the Well of Urd, beneath an ash tree, Yggdrasil, debating the fates of men and gods. The more immediate destinies of men are assigned by the Norns (Section 15). It also states Thor is a god as well. Long descriptions of the gods follow. Among the more memorable details are the Valkyries, the battle maidens whom Odin sends to allot death or victory to soldiers. Section 37 names 13 Valkyries and states that the source as the Poetic Edda poem Grímnismál. Odin's residence is Valhalla, to which he takes those slain in battle, the Einherjar (Section 20). Snorri quips: "There is a huge crowd there, and there will be many more still ...." (Section 39). They amuse themselves every day by fighting each other and then going to drink in the big hall. Toward the end of the chapter Snorri becomes prophetic, describing Ragnarök, the twilight of the gods. It will begin with three winters of snow, with no summers in between. Wars will follow, then earthquakes and tidal waves. The sky will split open and out will ride the sons of Muspell intent on universal destruction. They will try to enter heaven but Bifröst will break (Section 55). Heimdall will blow his mighty horn Gjöll and the Æsir and Einherjar will ride out to battle. Most of the Æsir will die and Asgard be destroyed. Snorri quotes his own source saying: "The sun will go black, earth sink in the sea, heaven be stripped of its bright stars;...." (Section 56). Afterwards, the earth rises again from the sea, is fairer than before, and where Asgard used to be a remnant of the Æsir gather, some coming up from Hel, and talk and play chess all day with the golden chessmen of the ancient Æsir, which they find in the grass (Section 58). Thor has defended Asgard and Ygg's [Odin's] people [the gods] with strength. By the time of the Ynglinga Saga, Snorri had developed his concept of Asgard further, although the differences might be accounted for by his sources. In the initial stanzas of the poem Asagarth is the capital of Asaland, a section of Asia to the east of the Tana-kvísl or Vana-Kvísl river (kvísl is "fork"), which Snorri explains is the Tanais, or Don River, flowing into the Black Sea. The river divides "Sweden the Great", a concession to the Viking point of view. It is never called that prior to the Vikings (Section 1). The river lands are occupied by the Vanir and are called Vanaland or Vanaheim. It is unclear what people Snorri thinks the Vanes are, whether the proto-Slavic Venedi or the east Germanic Vandals, who had been in that region at that time for well over 1000 years. He does not say; however, the Germanic names of the characters, such as Njord, Frey and Vanlandi, indicate he had the Vandals in mind. Odin is the chief of Asagarth. From there he conducts and dispatches military expeditions to all parts of the world. He has the virtue of never losing a battle (Section 2). When he is away, his two brothers, Vili and Vé, rule Asaland from Asagarth. On the border of Sweden is a mountain range running from northeast to southwest. South of it are the lands of the Turks, where Odin had possessions; thus, the mountains must be the Caucasus Mountains. On the north are the uninhabitable fells, which must be the tundra/taiga country. Apparently the Vikings did not encounter the Urals or the Uralics of the region. Snorri evidences no knowledge of them. There also is no mention of Troy, which was not far from Constantinople, capital of the Byzantine Empire and militarily beyond the reach of the Vikings. Troy cannot have been Asagarth, Snorri realizes, the reason being that the Æsir in Asaland were unsettled by the military activities of the Romans; that is, of the Byzantine Empire. As a result, Odin led a section of the Æsir to the north looking for new lands in which to settle. They used the Viking route up the Don and the Volga through Garðaríki, Viking Russia. From there they went to Saxland (Germany) and to the lands of Gylfi in Scandinavia (Section 5). The historical view is mainly fantastical. The Germanics were in Germany and Scandinavia during earliest mention of them in Roman literature, long before the Romans had conquered even Italy. To what extent Snorri's presentation is poetic creation only remains unclear. Demoted from his position as all-father, or king of the gods, Odin becomes a great sorcerer in the Ynglinga Saga. He can shape-shift, speaks only in verse, and lies so well that everything he says seems true. He strikes enemies blind and deaf but when his own men fight they go berserk and cannot be harmed. He has a ship that can be rolled up like a tablecloth when not used, he relies on two talking ravens to gather intelligence, and he consults the talking head of Mimir for advice (Section 7). As a man, however, Odin is faced with the necessity to die. He is cremated and his possessions are burned with him so that he can ascend to - where? If Asgard is an earthly place, not there. Snorri says at first it is Valhalla and then adds: "The Swedes now believed that he had gone to the old Asagarth and would live there forever" (Section 9). Finally Snorri resorts to Heaven, even though nothing in Christianity advocates cremation and certainly the burning of possessions avails the Christian nothing. Asgard is derived from Old Norse āss, god and garðr, enclosure; from Indo-European roots ansu- spirit, demon (see cognate ahura; also asura) and gher- grasp, enclose (see cognates garden and yard), essentially meaning "garden of gods". ^ "Asgard". Random House Webster's Unabridged Dictionary. ^ a b Lindow, John (2002) [First published 2001, by ABC-CLIO]. Norse Mythology: A Guide to Gods, Heroes, Rituals, and Beliefs. Oxford/New York: Oxford University Press. ISBN 0-19-515382-0. ^ "Asgard | Norse mythology". Encyclopedia Britannica. Retrieved 2017-08-28. ^ a b "From Troy to Scandinavia – Old Norse topographies". www.unibas.ch. Retrieved 2017-08-28. ^ "Asgard". American Heritage Dictionary of the English Language (4th ed.). New York: Houghton Mifflin Company. 2000. ; See also ansu- and gher-1 in "Appendix I: Indo-European Roots" in the same work. Snorri Sturluson (c. 1230). Heimskringla – via Wikisource. Snorri Sturluson (c. 1220). Prose Edda . Translated by Rasmus Björn Anderson – via Wikisource. Unknown. Poetic Edda – via Wikisource.